Whenever arcade news has slowed to a crawl, I always find myself checking out what’s going on in China. It’s true that we often see some clones/knock-offs being produced there but on occasion there is something new to discuss. 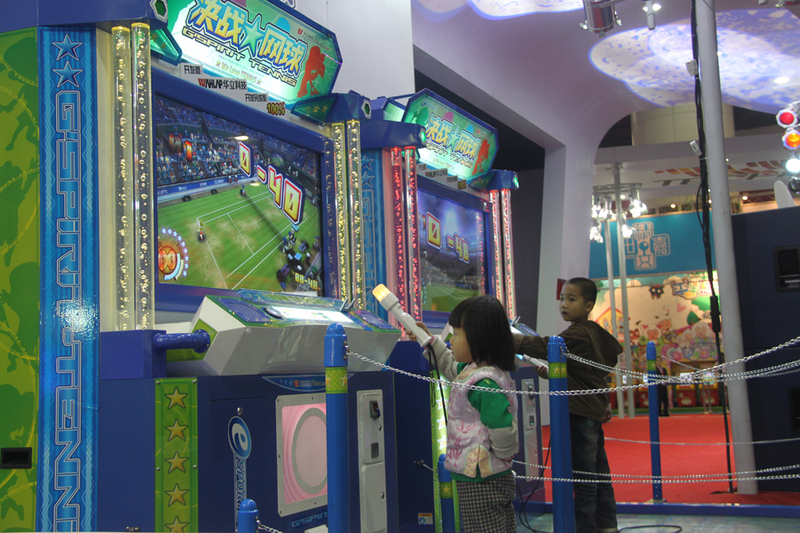 Such is the case with a recent game show there, or as the translator calls it, the “Seventh China (Guangzhou) International Exhibition of video game”. Here we see two new titles that a company called Wahlap Technologies is showing off, GSpirit Tennis and Storm Racer. Wahlap is distributor in China and Taiwan and in addition to carrying games by Konami, Raw Thrills and IGS (at this show they brought along GuitarFreaks XG, Terminator Salvation Super Deluxe and Speed Driver 3) they carry products by lesser known companies. For GSpirit Tennis(or also Battle Tennis), it was developed by a newcomer company called Hualikeji. It uses something that looks like the Wii and Playstation Move controllers had an unwanted love child together. Beyond that it also sports a 48-inch 1080P screen (that’s what the website claims, I have never heard of a screen coming in at that exact size though) and can link at least two units together.